A few color snapshots of Frances Philomena Selker. The date stamp on the right side of the photograph indicates April 1971. Frances was born August 25, 1895. She would have been 75 years old in these photographs. 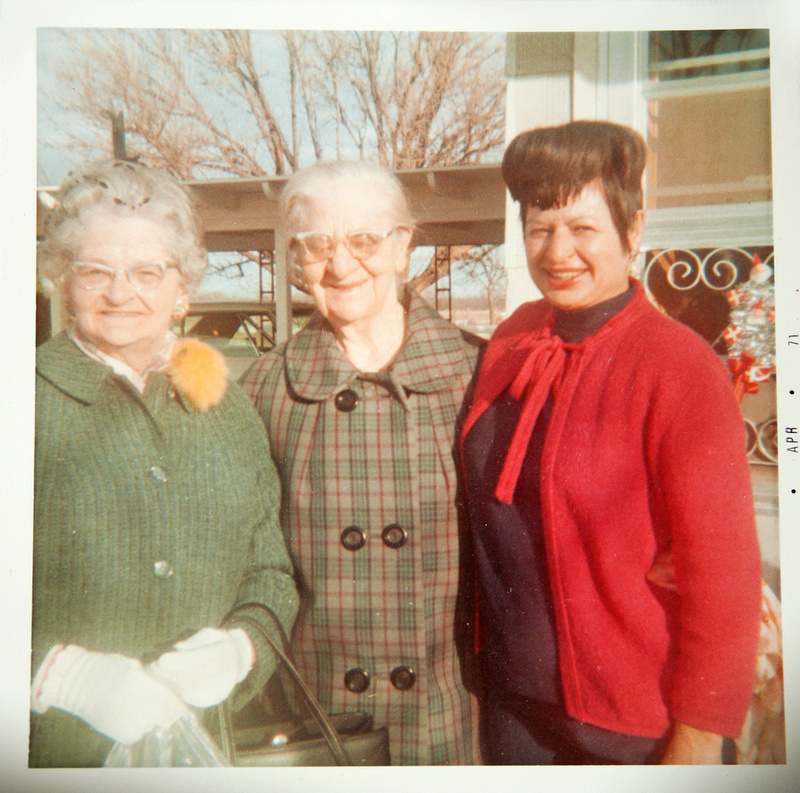 The first photograph is Frances Philomena Selker with Teresa Denise Kreller and Nelline (maiden name unknown). Frances Philomena Selker's daughter Eleanor Lucille McDonald married Teresa Denise Kreller's son George Andrew Bowden. Nelline married John Philip Bowden, brother of George Andrew Bowden. Frances is wearing gloves in this photograph. The location of this photograph is unknown. 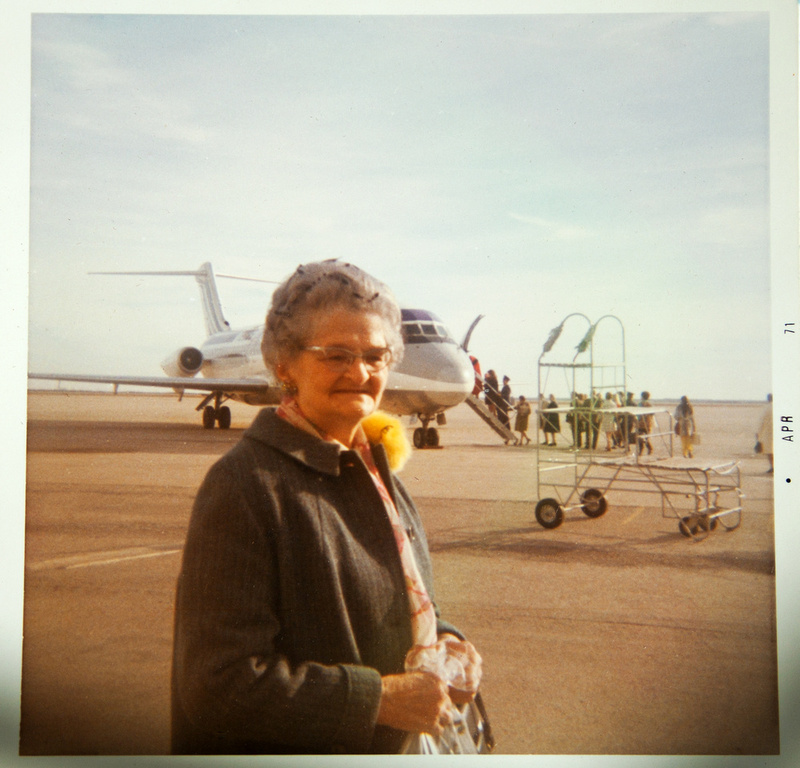 The second photograph shows Frances Philomena Selker at an airport. She is standing in front of an airplane being boarded outside. She is wearing the same jacket as shown above - but the jacket is unbuttoned. She has also removed her gloves. The location of this photograph is unknown. These two photographs were found in the Frances Philomena Selker Collection. Photographer Unknown. Editing and digital restoration by Michelle M. Murosky. Frances Philomena Selker is my great grandmother. She married Loraine Anthony McDonald. They are the parents of my paternal grandmother Mary Eugenia McDonald.